Several years ago I was asked by SQ member Nancy Santullo (Rainforest Flow, formerly House of the Children) to help fund water projects in the Peruvian Primary Tropical Rain Forest so that the indigenous people there, principally the Matsigenka tribe, could have clean water for the first time in the village of Yomybato. This was adjunct to a project funded in part by SQ Foundation and Derek and Linda O’Neill to bring water and sanitary bathrooms to the village of Tayakome. 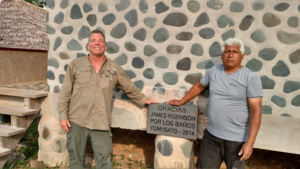 I agreed and funded the installation of a fresh water line from springs in the hills near the village across the Iron River in the Manu Protected Reserve to the village of Yomybato. Eager to share the incredible impact these projects have had on the Matsigenka tribe, Nancy was relentless in her requests that I visit Yomybato and see what my funding had help to accomplish for the people. I was able to convince SQ member Jennifer Anderson to accompany me and after getting all required vaccinations and shots (yuck!) we went to Peru to visit the water projects manifested by Nancy and funded by SQ, myself and others. We had no idea what to expect or what we would encounter. To say that Nancy Santullo is a saint for her dedication and vision is a gross understatement. No one can understand the hardships that Nancy endures in her quest to bring clean water to the indigenous people of the Matsigenka tribe. Try to imagine this kind of one way commute: (1) the first day is a 7-9 hour truck drive over one of the most dangerous roads I have ever travelled. Starting in Cusco, Peru (11,000 feet), the highest point of the road is about 13,500 feet elevation. The road then rapidly descends to the river town of Atalaya that must have been 12,500 feet lower. Traversing the Peruvian cloud forest, the views were spectacular although looking out of my window straight down for hundreds of feet on sheer cliffs without a guardrail was a bit disconcerting. The “highway” was dirt and about 8 feet wide, which made meeting buses and large trucks a bit of a shuffle. The highway was supposed to be one way on alternating days, but this, as many traffic laws in Peru, was largely ignored; (2) thereafter there are three days by boat up the Madre de Dios, Manu and Iron Rivers. By “boat”, I mean a 48 foot canoe with an outboard motor. We had to scrape across sandbars and submerged trees, which made travel difficult. One night, we had to camp on a sand bar because we couldn’t make the travel station by nightfall. We learned that the Spanish word for alligator is “Caiman” (as in “LOOK OUT FOR THE”) and there were plenty about. Thank God for the breezes on the river that made the temperatures bearable. The same commute is required on the way back to Cusco. One cannot understand what that boat trip was like unless they endure it. We were fortunate in that there were moderate temperatures and no rain. If we had to endure the torrential rains famous in that region we may never had made it to Yomybato. As it was, after roughly 36 hours in the boat, we finally made it to our destination. Nancy told us she has made this trip over 20 times. I am inspired and awed by her level of dedication and sacrifice. At the village, we slept in tents on a raised platform that had been constructed just for us to keep us above the poisonous snakes and cockroaches. Jungle living is not easy, survival is still the most important aspect of life. However, the improvement of the lives of the Matsigenka tribe by these clean water and sanitation projects is enormous and drastic. Water related illnesses and infant deaths have been drastically reduced. They no longer have to depend on the nearby contaminated river and streams (infested with harmful bacteria, contaminates and toxic waste) for their water source. Every dollar donated to SQ Foundation and Rainforest Flow has an immediate impact on the quality of the lives of children, women and adults. It is Nancy’s goal to bring a fresh water tap and a sanitary bathroom to each house (actually huts) and the schoolhouses in Yomybato and 6 other villages in the region. There is much more work to do. We were honored and celebrated by the Matsigenka people for bringing them fresh water, and it was overwhelming how much gratitude these people held for SQ Foundation and us for improving their lives for generations to come. I was given handmade bows and arrows and Jennifer and I received robes that had taken months to make. We were so touched by their innocence and gratitude. The children took an instant liking to Jennifer as she could instantly produce giggles and laughter with her dance moves and hugs. She taught the children how to “blow a kiss” and catch the kiss and put them in their heart. I would not be surprised to see statues of a 7 foot tall white Madonna with blond hair in their village in the future. We take clean water, hot showers and abundance of food for granted sometimes. I can promise you that I will always think of the Matsigenka people every time I take a hot shower, for they have none. At least now they have clean water to drink, to shower and soon a hygienic toilet, that won’t contaminate their eco-systems at the school and home. 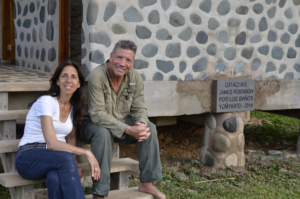 Funds donated to Nancy’s foundation named “Rainforest Flow” and SQ Foundation is impacting lives in enormous ways. Please consider donating generously for these projects.